Koka architecture + design inc. Amateur Ideas for Expert Projects ? In order to become the “greenest city on the planet by 2020,” the British-Columbian metropolis organized in 2011 a series of three idea competitions called “re:CONNECT”. One of them investigated an ancient industrial district, False Creek Flats, while questioning the future of its viaducts. Being an open international competition, there was a particular concern for the inclusion of a variety of people therefore accepting proposals from both professionals and amateurs candidates. Visualizing the Viaducts asked designers to explore possibilities for the future of urban planning in regards to the Georgia and Dunsmuir viaducts giving on English Bay. In a way, there were endless possibilities; from the conservation of the site to a clean slate. The bitumen ground and the colossal concrete being called for new vocations, the request showed a tangible tension between rupture and continuity. Organizers prompted participants to keep in mind six strategic orientations adopted by the city for directing the urban development in a sustainable way while imposing three evaluation criteria: creativity, respect of regulations and municipal engagements, and the ability to answer three viaducts-oriented parameters, being the urban grid, ground uses, and questions about mobility. Finally, the participants had a bit more than a month to submit their ideas. While one could understand this competition in the context of sustainable development-oriented questions, it is also possible to see it being a part of a larger public consultation operation that investigates urban development. It is important to note that there were also private consultations occurring with both work-interested parties and further independent urban design studies in relation to the viaducts during this competition. The competition attracted around 50 proposals from 7 countries, of which 70% were Canadian and 80% were from the Vancouver metropolitan area. A certain blur was maintained by the organizers relative to the competition demands suggesting that professionals were not systematically the best to answer to this challenge. Beside the fact that the object of this competition was well defined, that being a reaction to a precise industrial context, projects could oscillate in scale from urbanism, to landscape, to architecture. In the end, even if the jury was formed by well-known members, including Patricia Patkau, it could not agree on one single proposal, but rather decided to pick four laureate proposals. Without the possibility to further explore deliberations because there was no jury report communicated to the CCC team, it is reasonable to emphasise the subject of the competition question; despite the numerous criteria, no question was clearly identified by organizers. As previously mentioned, the submission review allowed for a large variation of intervention scales; some were oriented toward large ensembles, others were more interested in the spaces formed by the viaducts. A document obtained by the City gave a repertoire of key themes emerging from all the proposals and revealed a structural approach by which categories were elaborated. The resultant matrix showed a first, horizontal axis describing the “infrastructures retention” (retain / modified / complete removal), and a second, vertical axis associated to functions related to the program (“traffic” / “public & cycling link” / “traffic & public” / “neither”). Otherwise, central themes seemingly emerged: “park space”, “activated ground plane”, “introduction of water”, “bikes & pedestrians”, “engaging the structures”, “introduction to development”, “build under the viaducts” and “tunneling of traffic”. The categorisation was still, after all, a reshuffle of the proposals without a real conclusion. Seeking different scales, the examination of the winning entries seemed to reveal clarity through their formulation of questions, thus delimitating the possibilities for interventions related to the viaducts. The proposal “- Viaducts = Parks +” was similar to an urban management operation and revisited the ecologist triad along the three spheres “people & history”, “nature” and “connectivity” for a complete removal of the viaducts. The competition boards were composed with well-defined narratives, strengthening the idea of a “solved” project, and a series of vignettes aiming for an individual answer to the numerous criteria this competition could present. Putting forward pragmatic means for defining the triad, a call for a celebration of Histories of the site was also given. "Periscopes & Projected Landscapes”, diametrically opposed to the precedent project, suggested to completely retain both infrastructures. Asking the question, “what could this area become that would enhance the space abandoned by mainstream society?” this celebration of the abandoned space gave as result a poetic proposal in the hopes of telling a story about public events, while using collage as medium of representation. The viaducts being “Mental markers” of the City bring to mind “massive canopies” allowing opportunities for some “urban-street art”. With an evocative title like “New & Reused,” this project proposed an architectural intervention axed on a smaller scale offered by viaduct, suggesting a less global proposal than the previous two. Driven by an interest in the appropriation of these structures, this proposal aimed for partial transformations where the viaducts could act as “roof” or as “ramp for cyclists and pedestrians”. According to the designer, I-beams obtained from the dismantling would be reused analogically to the stones from the Roman walls reinvested in a posteriori constructions, and then pilled one after the other resulting in a public grotto with the oculus recalling a certain Pantheon. Ultimately the proposal aims to convey the global and urban impact of this architectural event with considerations for bikes, pedestrians, water, and vehicles movements. While the fourth winning entry did not present the most impressive graphic design skills, it stood out as a result of challenging the commission by suggesting altering existing viaducts. The two sequenced competition boards showed a reflective rather than prescriptive dialect: the first one, called, “The Viaducts” depicted vehicle circulation fluxes at the moment, questioning the pertinence of putting aside such infrastructures while denouncing the visual barrier caused by their presence. The second one, “The Ramps” proposed a diversion of the viaducts by relocating and burying them. 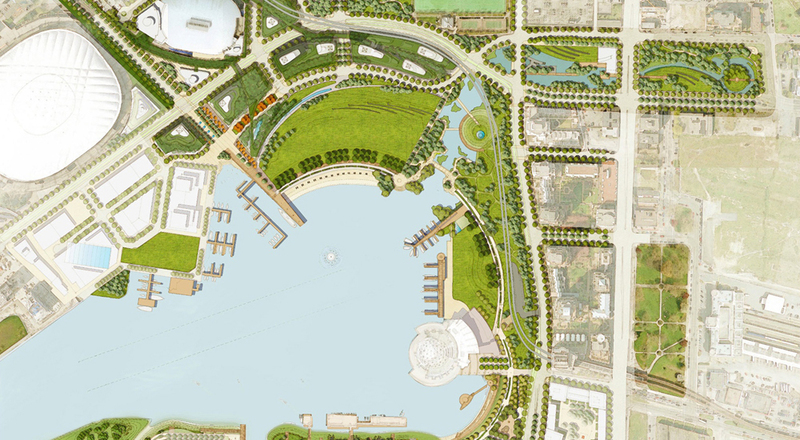 The logic behind this design is to reduce urban congestion and to increase pedestrian access toward False Creek. It was expressed clearly from the beginning that this competition would act as a tool for public consultation so that it could become a survey of ideas made for nourishing the designers in charge. Because of this, it becomes logical why the jury chose 4 laureates, holding back from freezing one idea in particular by putting the emphasis of formulating questions from a citizen’s point of view. Nevertheless, the organisers had the ambition that this competition would be an international event while generating a consultation space dedicated to the Vancouver’s citizens. This brings us to the question, is it legitimate to make citizen based consultation parallel to feasibility studies as a mean to link amateur ideas for expert projects? This component of the competition seeks conceptual design ideas for the land currently occupied by the Georgia and Dunsmuir Viaducts or for the structures. All ideas are encouraged: from full-retention with repurposing of the structures and/or land beneath, to complete removal and replacement with something entirely different, to combinations or other/new alternatives. Submissions will be evaluated on their creativity as well as their ability to move the City towards its goals as outlined in the Competition Principles and the City?s key objectives below. The Georgia and Dunsmuir viaducts are located between the existing neighbourhoods in Chinatown and International Village, and the newly emerging neighbourhood in Northeast False Creek. The original Georgia Viaduct was completed in 1915, extending Georgia Street from Strathcona to downtown over the CPR rail yards, industrial facilities and warehouses, providing east-west access to the downtown peninsula. Due to structural problems and ongoing maintenance issues, Vancouver residents voted to replace the Georgia Viaduct in the 1960s with a design that included two structures and continued to pass over the industrial lands of Northeast False Creek below. This design was part of the first phase of a larger freeway network that would have passed through Gastown and Chinatown, along the downtown waterfront, connecting to a third crossing to the North Shore. Thankfully, the viaducts were the only portion of the highway to be constructed, a decision that arguably is the most important city-building choice the city has ever made. Today the area around the viaducts has a much different context then when they were built. The railway yards have been removed and the industrial areas are no longer present. They still provide an east/west connection from Main Street to the downtown which provides a good connection for bikes and goods movement that is not present otherwise in this area. However, they also create a barrier (either real or perceived) for the area below and for linkages between Chinatown, Gastown and Strathcona to False Creek. In this competition, the City is interested in exploring a range of structural ideas for the viaducts, the surrounding street network, movement systems, and potential land uses. Aynsley, Mikeopenfile. (2 décembre 2011). The future of the viaducts and Eastern Core? : Design competition winners announced. Aynsley, Mikeopenfile. (21 novembre 2011). What the viaducts and Eastern Core could look like. Aynsley, Mikeopenfile. (29 mai 2012). Vancouver city staff recommends removing the downtown viaducts in latest analysis. Aynsley, Mikeopenfile. (6 juin 2012). Vancouver publishes detailed concept plan for the downtown viaducts. Bula, FrancesState of Vancouver (27 novembre 2011). What Vancouver could get from viaducts land: open space, below-market housing, more? Artibise, YouriYurbanism. (novembre 2011). Vote for re:Visualized Versions of Vancouver's Viaducts. Longhurst, AndyRabble.ca. (19 juillet 2011). Vision Vancouver's re:THINK: Obscuring housing crisis through the spectacle of competition. JOCJournal of Commerce. (2 décembre 2011). New Vancouver viaduct designs recognized at re:CONNECT competition. Kitchen, SeanThe Architect's journal. (29 septembre 2011). Re:Connect ideas competition, Vancouver. Nursall, KimThe Vancouver Sun. (5 juin 2012). Vancouver to hold first open house on future of viaducts today (with video). Press releasePublic art online project. (3 octobre 2011). The city of Vancouver announces the launch of re:CONNECT. Rossi, CherylVancouver courier. (2 décembre 2011). Public, professionals submit ideas for Vancouver viaducts: Winning juried entry envisions pedestrian and bicycle bridges. Stoymenoff, AlexisVancouver Observer. (23 novemvre 2011). What's your vision for Vancouver's viaducts?Public voting is open until Sunday in the City's competition for new solutions around the viaducts. Toderian, BrentSpacing Vancouver. (26 octobre 2011). No Freeways, but what about those Viaducts? Re:CONNECT Ideas Competition launched! VSPNVancouver Public Space Network. (21 novembre 2011). re:CONNECT design competition-vote for your favorite idea. Werb, Jessicastraight.com. (2 décembre 2011). re:CONNECT viaduct competition winners announced. W.White, RobertVancouver is awesome. (29 septembre 2011). re:CONNECT ideas competition.